It’s true: You can keep snakes out of your yard by installing a solid perimeter fence that is a few feet high, goes a foot underground, and slopes outward at a thirty degree angle. If you have a large yard, this project is going to get expensive—and fast! Instead of calling in the National Guard to help you fortify your home, there are a few other tricks you can try. Snakes, like any animal, are driven by the need to eat, find adequate shelter, and breed. 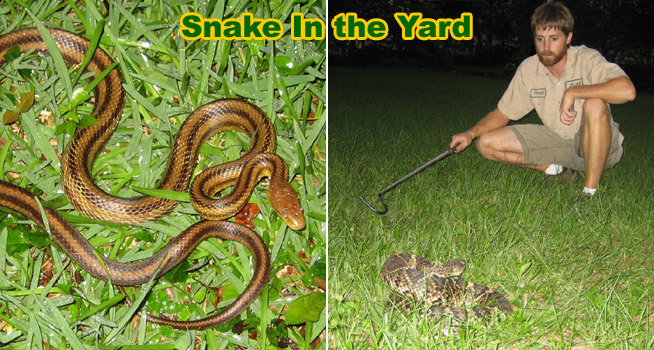 Knowing these three things will help you snake-proof your yard as much as possible. Because snakes need to eat, they are most likely to make their homes near an abundant food source. Depending on the type of snake you have, this food source is usually of the small rodent variety. If you have a problem with mice or rats, you have the potential to create a problem with snakes. Make your home as unappealing to the mice as possible. Close up open trash bins, clean up debris piles in the yard, keep your grass mowed, and seal up any holes in the exterior of your home. Eliminating the food source will decrease the likelihood of a serpent settling in. Similarly, chipmunks and squirrels can be potential food for snakes, so bird feeders may want to be eliminated as well, at least until you get the problem under control. Some snakes will climb trees and eat bird eggs—another reason to consider removing your bird feeders for a short while. Shelter is another necessity for snakes. As reptiles, these animals are coldblooded, and a heat source can be an additional factor in how they select their locations. If you have a decorative stone garden or patio, the stones will warm up nicely under the summer sun, providing an ideal location for a cold snake to bask after hours. Stone formations often have cracks that serve as entry points for snake holes. Do a thorough walk-around of your home and garden. Any spots with the potential for a snake hole should be sealed up. Low brush or thick vegetation should be cleared. Loose mulch should be replaced with decorative gravel. When people think of snakes, they often don’t think of snakes climbing into the home or into an attic or crawlspace. Snakes can climb, and many do if they feel they might have a warm nest waiting for them. Closing up the holes around your home—upstairs and downstairs—is not only good rodent control, it is good snake control, too. With your home sealed up and the rodents at your neighbors, the snake has neither food nor adequate living quarters. Read more about What attracts snakes. You can read this page for more tips on how to inspect your property and how to find a snake in your yard and identify vulnerable snake areas. Procreation is what living things do, and snakes are no exception to this rule. Many snakes give birth to live young, and because of this, a mother snake will want a safe area to leave her offspring. Infant snakes will not remain with the mother. Almost all reptiles are on their own immediately after birth, so the snakes that were just born will be out in search of their own homes and sources of food. If you have not eliminated their food source and closed up any potential dens, the baby snakes will see no reason to move on from your yard. It is very easy for the issue of one snake to turn into a multiple snake problem. If you’re lucky enough not to have a snake in your yard yet, prevention is worth a hundred cures. You basically have three options for getting rid of your snake(s). First, you can call a professional wildlife expert from my below directory. This person can catch and remove the snake(s) and take other actions necessary to solve the snake problem. Second, you can purchase a snake trap if you wish to catch the snake yourself. Third, you can modify your land and seal up your house to help keep snakes away and out of the house.